If ever there was a movie made entirely out of nostalgia and joy, by a filmmaker at the heedless height of his powers, that movie is Federico Fellini’s “Amarcord.” The title means “I remember” in the dialect of Rimini, the seaside town of his youth, but these are memories of memories, transformed by affection and fantasy and much improved in the telling. Here he gathers the legends of his youth, where all of the characters are at once larger and smaller than life -- flamboyant players on their own stages. At the center is an overgrown young adolescent, the son of a large, loud family, who is dizzied by the life churning all around him -- the girls he idealizes, the tarts he lusts for, the rituals of the village year, the practical jokes he likes to play, the meals that always end in drama, the church’s thrilling opportunities for sin and redemption, and the vaudeville of Italy itself -- the transient glories of grand hotels and great ocean liners, the play-acting of Mussolini’s fascist costume party. Sometimes from this tumult an image of perfect beauty will emerge, as when in the midst of a rare snowfall, the count’s peacock escapes and spreads its dazzling tail feathers in the blizzard. Such an image is so inexplicable and irreproducible that all the heart can do is ache with gratitude, and all the young man can know is that he will live forever, love all the women, drink all the wine, make all the movies and become Fellini. 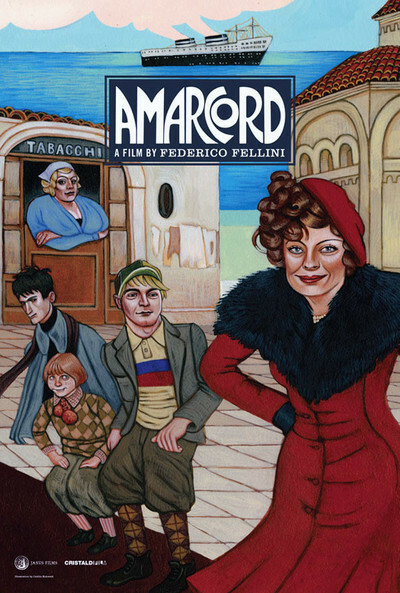 “Amarcord” is Fellini’s final great film. The other masterpieces are “La Strada,” “Nights of Cabiria,” “La Dolce Vita,” “8 1/2” and “Juliet of the Spirits.” He made other films of consequence, including “Il Bidone,” “Fellini Roma,” “Fellini Satyricon,” “Casanova” and “The Clowns,” but those six titles show him in the full flood of his talent. All of his films are autobiographical in one way of another -- feeding off of his life, his fantasies, his earlier films -- and from them a composite figure takes shape, of a hustler on the make, with a rakish hat and a victorious grin, spinning delight out of thin air, entranced by dreams of voluptuous temptresses, restrained by Catholic guilt -- a ringmaster in love with the swing dance tempos of the ‘40s and ‘50s, who liked to organize his characters into processions and parades. Fellini was more in love with breasts than Russ Meyer, more wracked with guilt than Ingmar Bergman, more of a flamboyant showman than Busby Berkeley. He danced so instinctively to his inner rhythms that he didn’t even realize he was a stylistic original; did he ever devote a moment’s organized thought to the style that became known as “Felliniesque,” or was he simply following the melody that always played when he was working? The melody was literal most of the time. Like his Italian contemporaries, he post-synched most of his dialogue, so it didn’t matter so much how his actors read their lines, and he often had a small orchestra or a phonograph to supply music while a scene was being filmed. That’s why so often in a Fellini film the actors don’t seem simply to be walking, but subtly moving to an unheard melody. They seem to be able to hear the soundtrack. “Amarcord” is like a long dance number, interrupted by dialogue, public events and meals. It is constructed like a guided tour through a year in the life of the town, from one spring to the next. There are several narrators, including an old rummy-dummy who visibly forgets his lines, and a professor who lectures us learnedly on the town’s historical precedents. Other narrators include the singing voices of the children, heralding the arrival of the first dandelion balls of spring, and a confiding voice on the soundtrack that is Fellini himself. The film is set during the stage-opera phase of Italian fascism, which it sees as a delusion of foolish people -- and yet the father in the family, a communist who plays the Internationale from a phonograph in the church tower to protest the visit of a fascist leader, is no less foolish. Politics in “Amarcord” are on the level of the endless battle between the parish priest and the communist mayor in The Little World of Don Camillo, Giovanni Guareschi’s best-seller of a half-century ago: Both sides are so Italian they prefer the fun of their public drama to winning or losing. Fascism was no fun in real life, but for that you have to see De Sica’s “The Garden of the Finzi-Continis,” because in Fellini’s garden only characters grow. The town itself is a character. We meet the buxom Gradisca (Magali Noel), who runs a beauty parlor and parades her innocent carnality and her red fur hat past the inflamed local men as if she had been elected to a public office; and Titta (Bruno Zanin), who finds Gradisca beyond his reach but boldly offers to show the voluptuous proprietor of the tobacco shop that he is such a man he can lift her off her feet; and “Ronald Colman,” who runs the local cinema; and Titta’s father (Armando Brancia), who rules the family table with what is intended to be an iron hand; and Titta’s mother (Pupella Maggio), who offers to kill herself more or less daily because of her husband’s idiocy; and her brother, who vainly trains his hair beneath a net and focuses on his meals with a hypnotic concentration; and the local priest, obsessed with whether the boys touch themselves; and all of Titta’s playmates, who gather for enthusiastic mutual touchings of self. Every day brings a drama. Every summer the family liberates Uncle Teo from the local asylum for a picnic in the country, and this year while they are distracted he climbs a tree and refuses to come down, moaning “I want a woman!” like a lovesick bull. He throws apples at those who try to climb up to him, and finally the family sends to the asylum for help, and a midget nun arrives to order Teo down. This nun wears a headdress so exaggerated we never see her face, and form an instant opinion that she is, in fact, a man. The arrival of a provincial fascist leads to an absurd public ceremony, all of the fascists trotting from the train station to the public square, where a papier-mache Mussolini looks like a comic bulldog. The local youth go through gymnastics exercises no doubt connected to national security. We also glimpse their education, in a hilarious montage of classes in the local school, one interrupted by the most novel and ingenious delivery of urine that can possibly be imagined. The film’s most beautiful scene involves the snowfall and the peacock feathers. The snow is plowed into impossibly tall walls to make a maze between which the boys and Gradisca have a snowball fight. The saddest scene, at the beach, is Gradisca’s wedding to a slick fascist leader; the marriage is of their hopes and their doom. She pulls away from her husband to throw her bride’s bouquet, but there is no one to catch it. The film is saturated with Fellini’s affection for these people, whose hopes are so transparent they can see through their own into another’s. All of the Fellini visual trademarks are here, including the half-finished scaffold that mediates between heaven and earth, and the grotesque faces of the extras, and the parades and processions, and always the Nino Rota music (and his arrangements of standards, especially “Stormy Weather”). Fellini shoots in color, and makes special use of the reds and whites of Gradisca’s outfits. He is careful to stay mostly in mid- and long-shot, the correct distance for comedy, and uses closeup mostly for intense longing. His film seems almost to flow from the camera, as anecdotes will flow from one who has told them often and knows they work. If there is a bittersweet undertone, perhaps it is because Fellini suspected the film business was changing and his funding and access would never again be the same; this was the last of his films made for no better reason than Fellini wanted to make it. Federico Fellini’s “Amarcord” takes us back to the small Italian town of his birth and young manhood, and gives us a joyful, bawdy, virtuoso portrait of the people he remembers there. He includes a character undoubtedly meant to be young Federico -- earnest, awkward, yearning with all the poignancy of adolescent lust after the town beauties. But the movie’s not an autobiography of a character. It’s the story of the town itself. We see it first when the dandelion seeds blow in from the fields, signaling the arrival of spring. The townspeople gather in the piazza to build a ceremonial bonfire and burn the witch of winter, and as they dance around the flames in one of Fellini’s beloved processions, we get to know them. They’re of all sizes, sexes, and ages, but they’re bound together by their transparent simplicity and a strain of cheerful vulgarity. Fellini likes their weaknesses as much as their virtues, and gives us the pompous lawyer, the egotistical theater owner (who cultivates a resemblance to Ronald Colman), the buxom beautician Gradisca flaunting her delightful derriere, and especially the lustful adolescents and their tormenting fantasies. Fellini also gives us, in a much more subtle way, some notion of the way fascist Italy of the early 1930s helped to shape these people. In an authoritarian system, the individual has fewer choices to make, and there’s a temptation to surrender the responsibilities of freedom. The townspeople are almost children in their behavior, taking delight in the simple joys of eating and making love and parading around the square and gossiping about each other and about the hypnotic Gradisca. Fellini implies that this simple behavior is nourished by a system that encourages a mindless going along -- but “Amarcord” isn’t a political movie. It is a memory, fond but merciless, of how it was in Italy at a certain time. It’s also absolutely breathtaking filmmaking. Fellini has ranked for a long time among the five or six greatest directors in the world, and of them all, he’s the natural. Ingmar Bergman achieves his greatness through thought and soul-searching, Alfred Hitchcock built his films with meticulous craftsmanship, and Luis Buñuel used his fetishes and fantasies to construct barbed jokes about humanity. But Fellini .. well, moviemaking for him seems almost effortless, like breathing, and he can orchestrate the most complicated scenes with purity and ease. He’s the Willie Mays of movies. He did hit upon hard critical times, though. After the towering success of “La Dolce Vita” and “8 1/2,” and such 1950s landmarks as “La Strada” and “I Vitelloni,” he began to indulge himself (his critics said). “Juliet of the Spirits” was too fantastical and structureless, and “Fellini Satyricon” was an exercise in excess, and “The Clowns” was really only a TV show, and “Fellini’s Roma” was episodic -- a great director spinning out sequences that contained brilliance, yes, but no purpose or direction. I couldn’t agree with those criticisms. I find Fellini’s magic spellbinding even when he’s only marking time, as he was to some extent in “Roma.” But now, with “Amarcord,” Fellini returns to the very top of his form. And he has the last laugh on the critics of his “structureless” films. Because “Amarcord” seems at first to be a series of self-contained episodes and then reveals a structure so organic and yet so effortless that at its end, we can only marvel at this triumph over ordinary movie forms. And we can marvel, too, at how universal “Amarcord” is. This is a movie for everybody, even those who hardly ever see foreign or “art” films. Fellini’s greatest achievement, in my opinion, was “8 1/2.” But that was a difficult film that revealed its meaning only after a good deal of thought and repeated viewings. “Amarcord,” on the other hand, is a totally accessible film. It deals directly, hilariously, and sometimes poignantly with the good people of this small town (actually Fellini’s birthplace, Rimini). It’s no more complicated than they are, it understands them inside-out, and the audiences I’ve seen it with (three times) have been moved to horselaughs, stilled by moments of beauty, and then brought back almost to tears. It’s not only a great movie, it’s a great joy to see. Someone once remarked that Fellini’s movies are filled with symbols, but they’re all obvious symbols. At the beginning of “La Dolce Vita,” for example, he wanted to symbolize the gulf between modern, decadent Rome and its history as the center of the Church, so he gave a statue of Christ being helicoptered by pilots who wave and whistle at girls sunning themselves in bikinis. The scene says everything it needs to say, openly and with great economy. “Amarcord” is obvious in that way, with a showman’s flair for the right effect. There is a night, for example, when all the people of the town get into their boats and sail out to wait for the great new Italian liner to pass by. And when it comes, it towers hundreds of feet above the waves and has thousands of portholes -- and is, of course, only a prop built by the special-effects men. It drifts away into invisibility like a candle dying out. The image is of Italy itself in the 1930s: all grandeur and pomp and nationalism, but with an insubstantial soul. The movie is filled with moments like that, and they’re just right. But then there are moments of inexplicable, almost mystical beauty, as when the dandelion seeds drift in on the wind, or when an old lady sweeps up the ashes of the bonfire, or when a peacock spreads its tail feathers in the snow. At moments like that we’re almost blinded with delight. Hitchcock once said he wanted to play his audiences like a piano. Fellini requires the entire orchestra. er again be the same; this was the last of his films made for no better reason than Fellini wanted to make it.